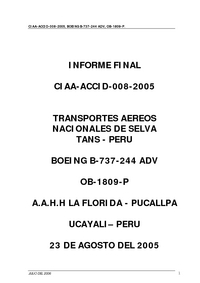 TANS Flight 204 departed Lima at 14:24 on a scheduled 53-minute flight to Pucallpa. After an intermediate stop there the airplane was to continue to Iquitos. At 14:52 the crew initiated the descent towards Pucallpa with the intention of carrying out a visual approach and landing. While approaching Pucallpa meteorological conditions deteriorated with towering cumulus clouds, strong winds and heavy rainfall. The runway 02 approach was unstabilized, but the crew continued the approach. The GPWS sounded as the airplane penetrated a severe hailstorm. The crew lost situational awareness and failed to abort the descent. The Boeing 737 crash-landed in swampland and broke up. It appeared that a copilot under instruction was in the right hand seat while the regular copilot was in the passenger cabin at the time of the accident. 1) The decision of the flight crew to continue the final approach and landing at the airport of Pucallpa in severe weather (storm). 2) The decision of the flight crew to descend unstabilized and not act to stop the steep descent to the ground at a descent rate of above 1500 feet per minute; what triggered the GPWS (Ground Proximity Warning System). 3) The decision of the flight crew not avoid the storm, not choosing to conduct a landing on the other runway or divert to the nearest airport until weather conditions improved. 4) The decision of the flight crew to penetrate the storm, it having been detected on weather radar aircraft approximately 190 miles in advance. 5) The loss of the horizontal and vertical visibility of the flight crew while penetrating the core of the storm (severe hailstorm). Severe hail causes obscuration of the front windows of the aircraft and therefore the total loss of situational awareness. Distance from Lima-Jorge Chávez International Airport to Pucallpa-Cap. FAP David A. Abensur Rengifo Airport as the crow flies is 489 km (306 miles).